Mullineux Family Wines was established in 2007 in the Swartland region of South Africa, owned and managed by Chris and Andrea Mullineux. Within a very short time period the winery established itself as one of South Africa’s most celebrated wine brands, both locally and on the international front. The Swartland has a very unique geology which allows for exploration of its various terroirs through Western Cape classic varieties like Chenin Blanc and Syrah, among others. The Mullineuxs are humbled by how winemaking enables them to interact with the ancient history of the mother rock. Growing up in Northern California, Winemaker Andrea Mullineux studied Viticulture and Oenology at UC-Davis before working in Stellenbosch and meeting Chris at a wine festival in Champagne. 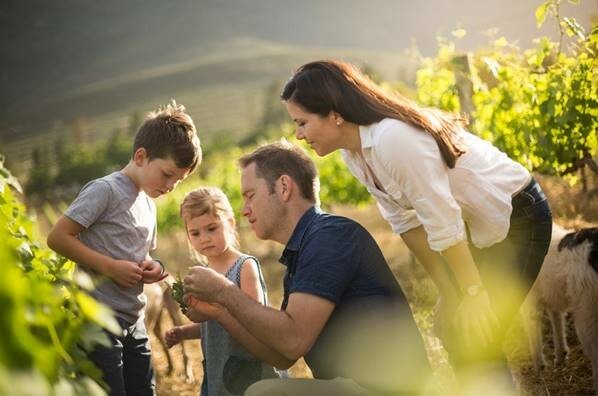 Chris is the Viticulturist, in charge of the vineyards on their farm on Kasteelberg Mountain as well as fruit sourcing for their value Kloof Street wines. To add to their acclaim, Andrea Mullineux was named Wine Enthusiast’s Winemaker of the Year in 2016.